The toddlers programme for children up to 24 months takes advantage of the toddler’s natural drive to act independently. CMPS advances each child’s growth and development through a rich and well prepared environment designed just for toddlers. Each curriculum area of the Montessori classroom emphasizes specific skills, but there is dynamic interplay among the areas, enhancing children’s natural learning process. 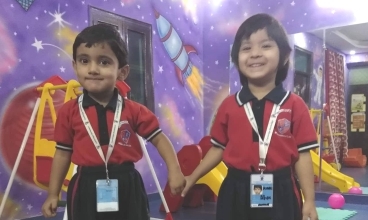 At CMPS, kids of age group 1-2 years are given a lot of importance since these years are crucial and hence lay an important foundation for the overall personality development of the child. 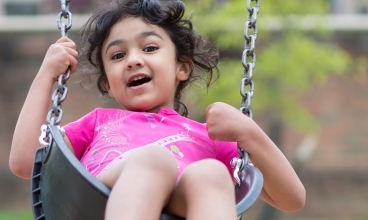 The toddler years are a time of great cognitive, emotional and social development. 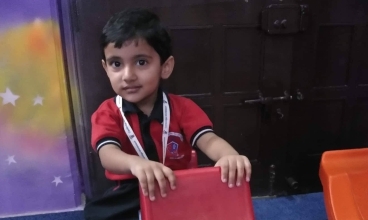 We at CMPS focus on physical and motor skills, sensory and cognitive development, making kids understand simple commands, imitate animal sounds, recite rhymes and stories in a fun way to get them settle down, help them to walk and sit on their own and handle natural calls. At Cambridge Montessori Pre School, we cater the age group of 2-3 years. We work on gross and motor skills, hand eye coordination, grasping power, settling them by reciting poems and stories, holding crayons and potty training. With the help of Montessori tools and presentations, they start imbibing problem solving skills in a happy and conducive environment. 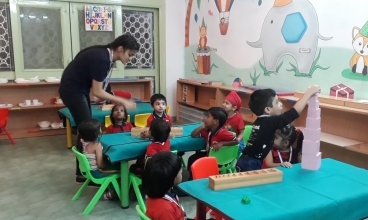 By teaching Math, English and EVS with modern and progressive techniques of Montessori materials, students at Cambridge Montessori Pre School get into formal schooling set up as per national educational guidelines. Understanding the age specific concepts by actively participating in Montessori Labs ensures that their analytical abilities, probing techniques, personality and individuality is at par with the global Montessori students. Reading, writing and speaking becomes easy for kids with the help of our advance curriculum devised with the input from our international experts on Montessori. 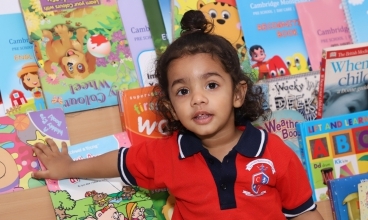 At Cambridge Montessori Pre School, our curriculum for LKG focuses on the overall development of the child and they take active participation in reciting poems and stories on their own. It prepares them for extempore. Making Math, English, Hindi and EVS easy for kids and making them learn it in a fun way. Preparing kids for formal schools by focusing on the overall personality development of children. At Cambridge Montessori Pre School, we make our students understand the basic concepts of prevailing curriculum as per the suggested guidelines. Our approach by virtue of involving students in to Montessori Lab is to get them ahead of the competition and make them ready for complex math at their level in a fun manner. Our trained teachers are very attentive and under a very caring environment, we let our students bloom and prepare them for the higher classes or moving into a formal set up school. Our curriculum is based on the suggested guidelines and inputs from the experts on Montessori and subjects & accordingly it is delivered the way it should be. Mind Lab @ Cambridge Montessori Pre School is an innovative workshop to instigate young minds to think beyond and expand the horizon of learning. It works on their grey matter and challenges their own limits in a scientific manner. 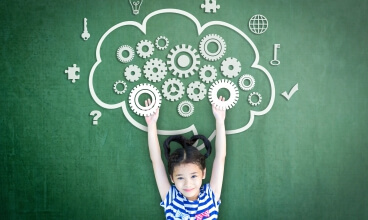 With our methodology for the development of thinking abilities and life skills in kids through strategy games, our mission is to prepare the next generation for complex challenges by virtue of strengthening a broad range of cognitive, emotional and social skills by teaching how to think reflectively and by encouraging the kids how to learn. We at Cambridge Montessori Pre School provide the best of trainers, the best of equipment, environment and a new vision of life from the very starting of their life to lead success in their life and create history for themselves. With so much of positive energy and drive by the current government and their emphasis on turning around the education system in India, we are poised to take a giant leap in early childhood education. A country with a powerful 1.3 Billion population with 65% of citizens below 35 years of age, a golden period has arrived for us. It opens lots of opportunities in education sector and to be precise “Teaching Jobs”. The preschool segment is facing a complete makeover as parents are now looking at value for money. Their aspirations have gone up and so is the challenge for early childhood educators. India needs more trained teachers and support staff for early childhood education as the competition is cut throat. We also see that parents are slowly moving on to true Montessori experience as being followed across the globe. This is turning more preschools into Montessori environment and hence our country needs a huge number of Montessori teachers, who are properly trained to handle children of tender age. Eligibility: 10+2 pass from any recognized board.